Younger viewers think they’re paying too much for streaming services — but they’re still willing to sign up if they want to watch a particular show. That could be good news for the Walt Disney Co., which earlier this month said it would launch ESPN- and Disney-branded streaming services, pulling some of its own programs from Netflix. This move “ultimately gives us much greater control of our own destiny,” Disney CEO Bob Iger said during a third-quarter earnings call. Of those youngest respondents who would subscribe to the Disney service, more than half (58 percent) said they would use it in addition to other streaming options, versus 34 percent of millennials who said it would replace another service. Overall, 55 percent of 18- to 29-year-olds said they were willing to subscribe to a streaming service to watch a particular show and also praised the ability to watch their preferred shows and movies. But millennials also expressed frustration with the proliferation of streaming services, which include Netflix and CBS All Access. More than half (57 percent) of millennials said they agreed with the statement that there are too many streaming services, and 73 percent of them said they wished all of the shows they wanted to see were available on a single service. 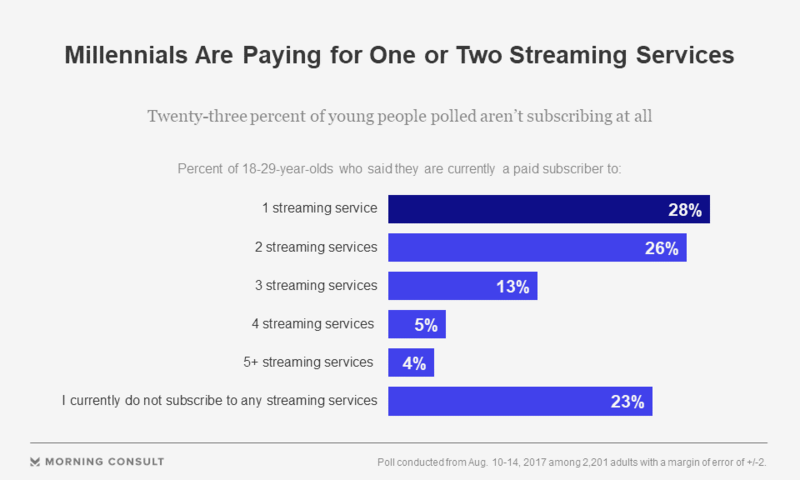 Forty-two percent of millennials also thought they were paying too much for streaming services, even though most of them, or 54 percent, subscribed to only one or two streaming services, and 26 percent don’t spend any money on their subscriptions. Jim O’Neill, a media consultant and analyst at Ooyala, a premium video-focused data company, said in an interview Friday that the increasing number of companies offering streaming to consumers does not necessarily mean there’s a “streaming bubble” waiting to burst. But the number of options could show there’s space for these subscription services to find a niche, such as Disney is proposing — a particularly good move for the company given recent declines in viewership for ESPN. If the standard paid television subscription runs consumers roughly $100, they’re likely to look at the options they have for various streaming services and realize how much more they can get for the same price, he said. The survey showed most Americans spend $10 or less on streaming services a month, while millennials are likely to spend slightly more, with 21 percent of them spending from $11 to $20 a month. But even among the younger cohort, 11 percent spend $21 to $30 a month on streaming, and 17 percent spend more than that. O’Neill likened cable’s waning popularity among young people to that of newspapers, at risk of becoming irrelevant if the model writ large doesn’t change. That’s because millennials and their younger counterparts are “so used to exploring for content on their own,” they’re not amenable to cable’s one-size-fits-all package. Netflix remains the dominant streaming service, with 52 percent of all respondents and 67 percent of millennials saying they currently subscribe to it. Amazon Prime video came in second, pulling in 26 percent of Americans and 28 percent of young people. YouTube TV fell to third place, attracting 15 percent of all Americans. It tied for third with Hulu without live television among millennials, with 23 percent. Cable, for its part, is still prevalent in people’s television rotation, as 71 percent of people said they subscribe to a cable or satellite service, although that number drops 21 percentage points among 18- to 29-year-old respondents. The poll surveyed 2,201 Americans from Aug. 10-14 and has a margin of error of plus or minus 2 percentage points. The numbers reflect a trend detailed in a March survey, in which Morning Consult data showed people aren’t watching any less television — they’re just increasingly choosing streaming services. At the time, 29 percent of young people said they were exclusively using streaming services to watch television, a larger share than of any other age group, and 54 percent of millennials said they turned to streaming more than traditional cable.